On arrival at the Rome Airport , you will be met and transferred to the hotel for check In after 1400 hrs, Rest of the day free. Overnight Stay at Hotel. After Breakfast proceed for Half Day Guided City Tour of Rome & Vatican . VisitRepublic Square with the Fountain of the nymphs , Spanish Steps, fountain of the Brancaccio, Trevi Fountain, the Pantheon, Navona Square , and the "Four Rivers Fountain", St. Peter's Square . Then we make Photo stop at the Colloseumfor an outside view. After Lunch drive to Pisa for an Orientation Tour where we seeleaning Tower of Pisa , Late afternoon we then drive to Florence .Overnight Stay at Hotel. After Breakfast proceed for a Guided City tour of Florence . See the Duomo , theCampanile, the Baptistery with its Gates to Paradise, Piazza Della Signoria an open-air museum of sculptures, the famous Ponte Vecchio bridge across the river Arno and Santa Croce .Drive to Piazzale Michelangelo , a square on top of a hill with its replica of the impressive statue of David and also get a bird's eye view of the city of Florence . Rest of the day free. Overnight Stay at Hotel. After Breakfast we drive to Venice Island for a Half Day Guided Walking Tour of Venice . We start our tour from Tronchetto Coach Park , our hostess who will assist you to take the boat to St Marks Square . From here you will visit the Cathedral of Venice , St. Mark's Basilica, the Doge's palace , Pass through the famous Bridge of Sighs you will reach the Prisons . Free time to explore this romantic city, later proceed back to Tronchetto Coach Park by boat and transfer to hotel. Overnight Stay at Hotel. After Breakfast drive through some beautiful Scenery in Alps to Innsbruck . On arrival there will be a Guided City Tour . Later check into the hotel. Rest of the day free Overnight Stay at Hotel. After Breakfast drive to Switzerland our next destination - Zurich . After brief Orientation Tour of City, free time for shopping. Evening transfer to Interlaken. Overnight Stay at Hotel. Hotel, and then we have Full Day Tour of Jungfrau . Drive deep inside the mountain to visit the impressive glacier falls, the Trummelbach falls . the only glacier falls in the world, which have been made accessible. Next, get ready for an adventurous ride to visit Jungfraujoch - the Top of Europe, aboard the 'cogwheel' train, which takes you to a height of 3,454 meters to reach Jungfraujoch! Experience the magic of the mountains and visit the Ice Palace on top of the longest glacier in the Alps . Later back to Interlaken , Drive back to your hotel in Lucerne . Overnight Stay at Hotel. After Breakfast, Full Day Tour of Mt Titlis with Lucerne , we proceed to Englebergwhere we take a sensational cable car ride up to Mt.Titlis. Marvel at the world's first revolving cable car ride, a truly once in a lifetime experience. With an elevation of 3020 m above sea level, Titlis is Central Switzerland's loftiest peak accessible by anyone, highest lookout point and only glacier. Later return to Engleberg and then transfer by coach to Lucerne . Orientation Tour of Lucerne where you can see Chapel Bridge and Lion Monument . Then in the evening we drive to Frankfurt . On arrival check into the hotel. Rest of the day free and easy. Overnight Stay at Hotel. After Breakfast ,enjoy Guided City Tour of Frankfurt where you will see Goethes House , our city square named Roemer Continue your tour along the skyscrapers and banking towers that gave Frankfurt the nickname "Mainhattan". Then drive to Amsterdam . On arrival in Amsterdam check into the hotel. Rest of the day free. Overnight Stay at Hotel. After Breakfast Half Day City Tour of Amsterdam . You will see by coach, the Royal Palace , the National Monument, the Skinny Bridge , the Albert Cuyp market and the beautiful houses along the canals . We will also visit a windmill on the river Amstel and a stop will be made at a diamond factory, Afternoon visit theKukenhof Garden (Entrance Included). Evening free. Overnight Stay at Hotel. After Breakfast we drive to Brussels for a Guided City Tour . Visit the old city centre. the world famous GRAND'PLACE with its unique city hall and splendid guild houses. We pass by the magnificent St. Michael's cathedral , the Congress column , the Heizel district with the renowned Atomium , the remarkable Chinese Pavilion and the Japanese Tower . Via the Palace of Laken we drive back to the center and visit theZavel district , The Triumphal Arch and St. Michael's Cathedral . After the impressive Court of Justice and the elegant Louise Square , we drive to the stately Royal Square , the Royal Palace and the old Palace of the Nations . the Jubel park with its grand Triumphal Arch and exceptional museums .The heart of Europe beats: the buildings of the Commission, the Council of Ministers and the European Parliament house the main institutions of the E.U. IN the evening check into the hotel, Overnight Stay. After Breakfast we drive to Paris . On arrival check into the hotel. Rest of the day free. Overnight Stay at Hotel. After Breakfast Full Day Guided City Tour. 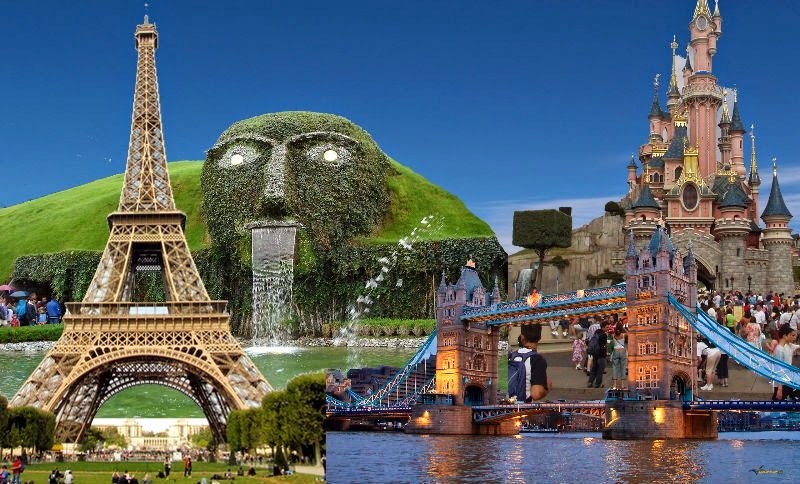 Visit the Opera square, Concorde square, Champs Elysees, Arch of Triumph, Trocadero square, Eiffel Tower, Invalids, PontNeuf, Bastille square and Opera, Notre Dame cathedral, Luxembourg gardens and Saint Germaindes Près and many more sights. We will visit Eiffel Tower (Level 2) (Admission Included). Later we will take a Cruise on River Seine (Cruise Included ). Overnight Stay at Hotel. After Breakfast transfer to Train Station for the Euro star Train to London (Standard Class tickets included). On arrival in London transfer to your hotel. Rest of the day free. Overnight Stay at Hotel. After Breakfast, Half Day Guided Panoramic City Tour of London visit London 's iconic landmarks like the Tower Bridge , River Thames, London Eye, Tower of London , Hyde Park, Big Ben, Westminster Palace , Westminster Abbey, St. Paul 's Cathedral, the famous Piccadilly Circus, and Nelson's Column at Trafalgar Square followed by the majesty of Buckingham Palace which is the Queen's official residence. Witness the Queen's Foot Guard in their red tunics and bearskins. After lunch time, will be free for shopping or your own activities. Overnight Stay at Hotel. After Breakfast at Hotel, time free at leisure until departure transfer to airport to connect your flight.